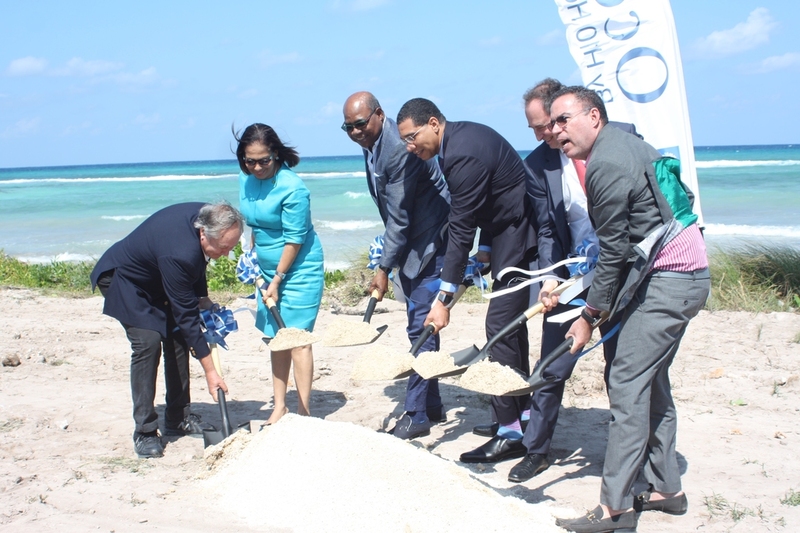 Prime Minister Andrew Holness (centre), Tourism Minister Edmund Bartlett, Industry Minister Audley Shaw, join Chairman of Amaterra Group Keith Russell and his wife, Paula (2nd & 3rd right respectively) at groundbreaking for the construction of the 800-room Amaterra resort in Trelawny. Amaterra Jamaica Limited has announced a major integrated real estate development which will result in the addition of some 8,000 hotel rooms to the parish of Trelawny overtime. 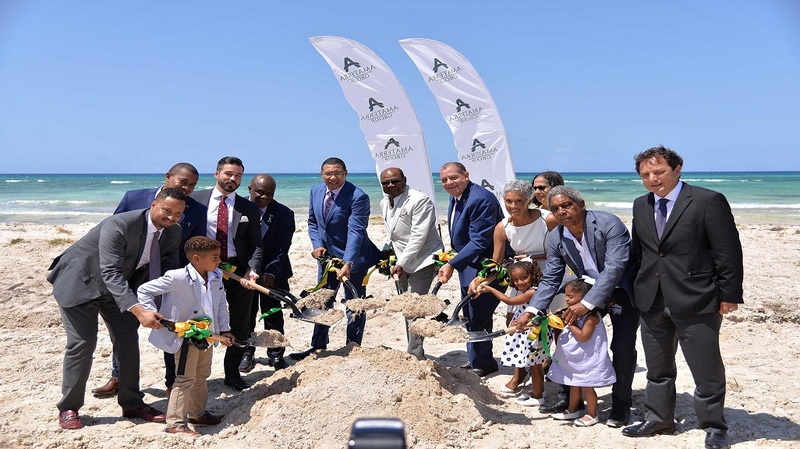 The announcement was made during Friday's groundbreaking ceremony for the construction of the Amaterra resort which will be a fully integrated 800-room facility over 27 acres of prime beachfront property in Stewart Castle, Trelawny. 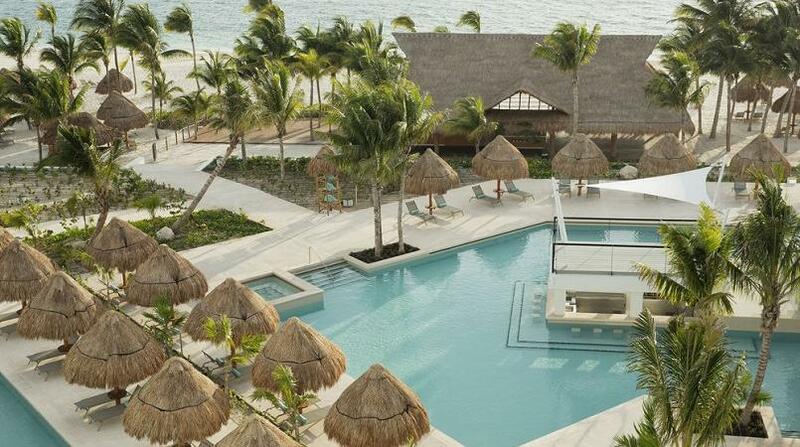 The second phase of the project will see the development of a 400-room resort nearby. The 1,200 rooms will sit on a part of the 1000-acre property which will form part of a township development to include other resorts, entertainment facilities, theme parks, a pedestrian town centre, manufacturing facilities, Special Economic Zones, and much more, surrounded by an amphitheatre-shaped ridge. Tourism Minister Edmund Bartlett said the Amaterra Groups concept is a reflection of the Tourism Innovation City concept which the ministry is now embarking on. "We are creating a tourism in Jamaica that is inclusive, and that involves the integration of the community. And one of the visions for us is to establish a tourism integration development arrangement that will be embodied in something called a Tourism Innovation City. The Amaterra Group, founded by Keith Russell, who is a former Member of Parliament for the North Trelawny constituency, and his wife Paula Russell; includes Tourism and Leisure Development International owner Francisco Fuentes and Rexton Capital Partners Limited owners Mustapha Deria and Guillermo Velasco on its board of directors. "From the moment I envisioned the concept, my wife and I, we have worked relentlessly to make it a reality. It is therefore with great pride that we are here today, witnessing the beginning of the dream," an elated Group Chairman Keith Russell said during the ground-breaking ceremony. He added: "The Amaterra development will be the first of its kind in Jamaica and the wider Caribbean region and with the help of our international partners we will create a model integrated township worthy of being emulated all around the world." Prime Minister Andrew Holness was proud that the Amaterra Group was formed by a Jamaican. 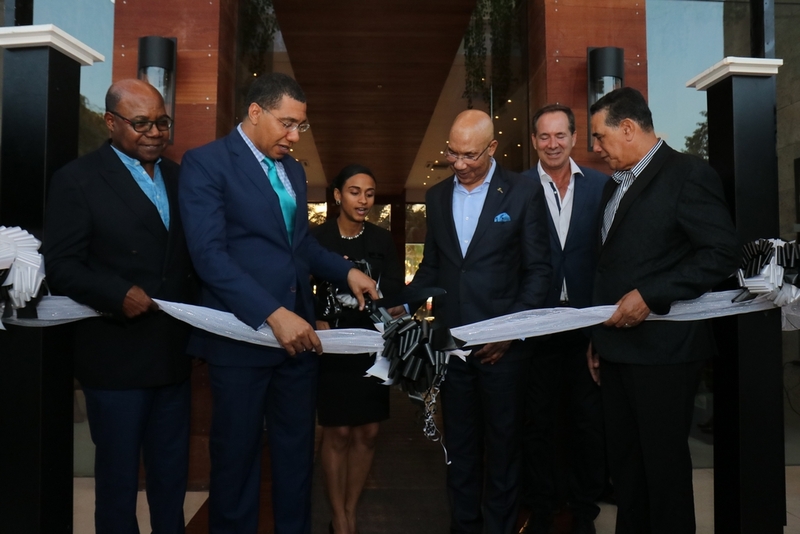 "I am very happy to support the notion expressed by Keith that this is a Jamaican company but it has a global outreach," Prime Minister Holness stated. Both Tourism Minister Edmund Bartlett and Minister of Industry, Commerce, Agriculture and FisheriesAudley Shaw, welcomed the development. Jamaica's tourism product will indeed be improved by these 1,000 acres of development and it takes the form as we have heard of a township. The link between agriculture and tourism is an umbilical one. And I want to commend the minister of tourism for using portions of the tourism enhanced fund for establishing a linkages network between our farmers and their ability to supply goods into the hotels and it is working and working well and it is going to grow," Shaw said.